In his annual address to Berkshire Hathaway shareholders, famed investor Warren Buffett warned of the dangers of holding dollar-denominated investments. Buffett’s concerns about the dollar stem from the world’s governments “solutions” to the ongoing financial crisis: The dollar is headed south, and “You can bet on inflation,” he told shareholders during a six-hour question and answer marathon. Although having dabbled in gold and silver in the 1960s , Warren Buffett’s legendary 130 Million Ounce purchase in 1998 made his statement on owning physical gold. 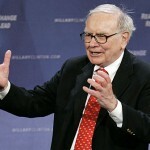 On April 4-29-2009, Warren Buffett’s famed Bershire Hathaway company announced a continuing buying spree of Gold companies in the USA to merge under their “Richline” gold brand. In 2007 Berkshire Hathaway started the buying and merger/acquisition strategy by the acquisition of Bel-Oro International and Aurafin LLC, forming the largest gold jewelry supplier in the USA. Berkshire Hathaway and its subsidiaries engage in a number of diverse business activities including property and casualty insurance and reinsurance, utilities and energy, finance, manufacturing, retailing and services. The common stock of the company is listed on the New York Stock Exchange.